(A) to a private room so she will not infect other patients and health care workers. (B) to a private room so she will not be infected by other patients and health care workers. (C) to a semiprivate room so she will have stimulation during her hospitalization. (D) to a semiprivate room so she will have the opportunity to express her feelings about her illness. (A) Lock all medications in a cabinet. (B) Child proof all the caps to medication bottles. (C) Store medications on the highest shelf in a cupboard. (D) Place medications in different containers. (A) Gloves, gown, goggles, and surgical cap. (B) Sterile gloves, mask, plastic bags, and gown. (C) Gloves, gown, mask, and goggles. (D) Double gloves, goggles, mask, and surgical cap. (A) A 72-year-old patient with diabetes who requires a dressing change for a stasis ulcer. (B) A 42-year-old patient with cancer of the bone complaining of pain. (C) A 55-year-old patient with terminal cancer being transferred to hospice home care. (D) A 23-year-old patient with a fracture of the right leg who asks to use the urinal. (A) Gloves, gown, goggles, and surgical cap — surgical caps offer protection to hair but aren’t required. (B) Side-lying — CORRECT: most effective to facilitate drainage of secretions from the mouth and pharynx; reduces possibility of airway obstruction. For the first questin,I think that you meant to put leukocytopenia, but instead put thrombocytopenia, which is a decrease in platelets. Leukocytopenia is the decrease in platelets.if it is a mistake by me please let know. Actually, the thrombocytopenia is correct, but is a distract or to see if you understand that A.L.L. actually impacts all cells produced by the bone marrow (platelets, RBCs, and WBCs). If the question had stated “lymphocytopenia” the answer would have been too obvious. 4/5. not bad.. i learned that toddlers could open a child proof containers. LOCK. Your first question on this set of practice questions seems to be a bit off. If we are worried about her BLOOD CLOTTING abilities, why are we debating on what type of room to put her in. I think that you meant to put leukocytopenia, but instead put thrombocytopenia, which is a decrease in platelets. Leukocytopenia is the decrease in WBCs and therefore puts said patient at increased risk for infection. Really should research and proof read before putting questions on here. People use this as a study aid for the NCLEX im sure. MAJOR fail! You must think about the risk for infection. This person has no immune sustem and therefore must be placed on reverse isolation so that minimization of pathogens is the goal. If the patient becomes infected, then the platelet count is of little significance as they would be on bleeding precautions anyway. That is an expected outcome in this situation. Though is not my first contact with nclex and cgfns..i got the idea from a friend that went to Accra Ghana for the exam in 2003/2004.As someone intending to go for this exam the question has really give me a deeper knowledge and has helped me a lot….THANKS. Recognized the questions from my Saunders. Every little bit of studying helps with confidence preparing for the exam. Thanks!! First time i solved the Nclex questions and i got 4 correct answers out of 5 questions.. Thanks..
thank u for ur kindly ljm questions..it help me to understand better this questions..thaks again..hope get good result in ljm which on next month…. it really helped a lot 🙂 advance reviewing is the best way to success!! it’s really nice to review…..thank u……..rationale for each one helps to understand more………….expectiing more queations from u.
THNKS A LOT 4 THIS QUESTIONS HELPS ME FRM MY REVIEW.GOD BLESS! 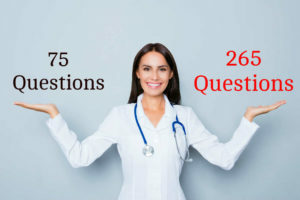 hi, do you have nclex-rn questions and answer material- latest edition. If so how much? Would appreciate a quick response from you. Thanks. i already read it in my books saunders . . so i answered it all correctly.. thanks for this site.. tough!!! but meaningful and i learned a lot..